Does your child have an affinity for music? Do they enjoy creating buildings and cities with Legos? Are they strong mediators who work well in groups? What about you? When I was young, intelligence meant having all the right answers. (At least that’s the definition I internalized). It had little to do with creativity or problem-solving, and could be measured as a relatively fixed quantity through things like standardized tests. Thankfully, there are now other paradigms on the block. As every parent knows, children have unique strengths. Some are wizards with logic puzzles and numbers; others can write stories that crack us up or touch our hearts. People are not born with a uniform cognitive capacity that is easily measured by short-answer tests – intelligence is more complex than that. 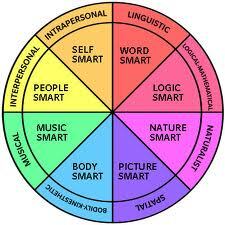 The Theory of Multiple Intelligences was proposed by Howard Gardner in 1983 as a new model for understanding how people learn. He identified nine different types of intelligence, of which each person has their own unique combination. (The Existential intelligence is not listed in the image above, however we’ll explore all nine types of intelligence in this series). One of the greatest benefits of this theory is seeing more parents and educators recognize, appreciate & nurture the different strengths and skills children call upon when engaging the world. It informs on how we can best communicate and interact with each child to help them learn and grow. It is a great gift to understand the unique ways children learn. When we understand what speaks to our children (and to ourselves), we are in a much better position to guide their development and help them reach their potential. Stay tuned for part 2 of this Overview of Multiple Intelligences for Parents! In upcoming posts I’ll explore each type of intelligence in more detail, share stories about how they’ve come up in the classroom, and explore how parents can use this knowledge at home. What is your learning style? What do you notice about how your children learn?